Best Disk Cleaner Software, fix PC errors in 3 Steps! Smart Disk Cleaner Pro allows you to easily clean up disk space that is used by temporary files like those in the system temporary folder, the Internet Explorer Cache and Cookies folder, Recycle Bin and various other areas of your system. In addition, you can erase personal tracks like recently used documents, typed URLs and more. The program comes with an attractive, user friendly interface. Smart Disk Cleaner Pro allows you to create cleaning profiles, and can automatically run at system start without user intervention. It supports Internet Explorer, Firefox, Chrome and Opera as well as various 3rd party applications. This tool cleans a lot more files than most similar products and includes a "slim down" mode that gets rid of a lot of extraneous objects including wallpapers and other Windows files you may never use. Smart Disk Cleaner Pro provides an easy and comprehensive solution for uninstalling unwanted programs, whether they are installed ones running properly on your computer now or corrupted ones after failed uninstall. Additionally, Smart Disk Cleaner Pro helps speed up your PC by removing junk files and duplicate files, cleaning the registry and defragmenting disks. Smart Disk Cleaner Pro can completely remove more than one thousand commonly-used applications, like Windows Live Messenger, Adobe Reader!, AVG Anti-Virus, Bit Defender Anti-virus, ESET NOD32 Antivirus, Eset Smart Security, Kaspersky Anti-Virus, Norton Anti-Virus, malicious browser plug-ins and much more applications! The Windows registry is the heart of your operating system. Every hardware component and software program that's installed on your computer creates a registry entry that contains information and user settings. Over time, as peripherals and software applications are installed, upgraded, and deleted, the Windows Registry becomes clogged up with entries that are invalid or unnecessary, which can lead to erratic system performance and loss of valuable disk space. Smart Disk Cleaner Pro provides a lot of functionality from a simple, elegant, easy-to-navigate, and clearly labeled interface. This free app lists six categories of items to clean: Windows Histories, Program Histories, Browser History, Cookies, Messengers, and Plugins. 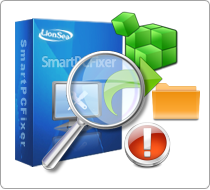 * Smart Disk Cleaner Pro will fix PC errors in 3 Steps!